Wolls advanced titanium reinforced nonstick cooking surface has superior durability and excellent cooking performance. It is guaranteed not to crack, blister, bubble or separate. Titanium is one of the hardest metals and is used in many high tech products such as fighter planes, surgical instruments, hip replacements and golf clubs. The Titanium reinforced nonstick cookware is produced in our state of the art facility in Germany. For healthier cooking, no oils or fats are required. The extra thick body and base is made of stress relieved chill cast aluminum. This process allows for fast and even heat distribution, and better browning, searing and deglazing. These pans are milled perfectly flat for use on all types of ranges; gas, ceramic, electric, radiant and halogen. These pans are guaranteed not to warp. Patented German designed and engineered detachable handle insures easy click-on and click-off, for stove to oven cooking or storage. Each pan has a cast-in threaded brass insert to guarantee that the handle screws never strip or loosen. Ideal for anywhere storage or cooking space is at a premium. With the handles removed it fits easily into the sink or dishwasher. Vented safety glass covers with Stainless Steel rims are available for separate purchase. Titanuim Nowo cookware is oven safe (remove detachable handle, side handles and cover knobs are safe to 500F/260C). Nowo pans are metal utensil and, dishwasher safe plus are PFOA free. Made in Germany with a limited life time warranty. 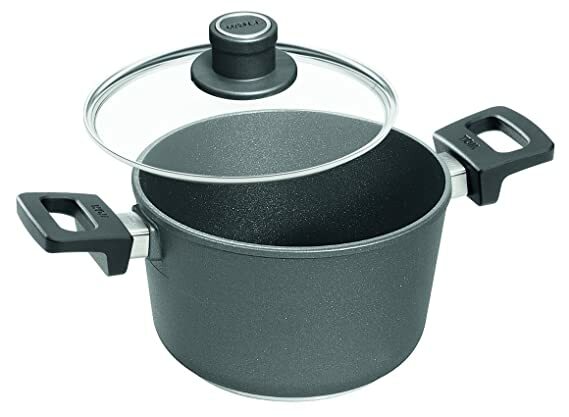 Woll Nowo advanced PFOA-free titanium reinforced nonstick cookware makes light work of good cooking. 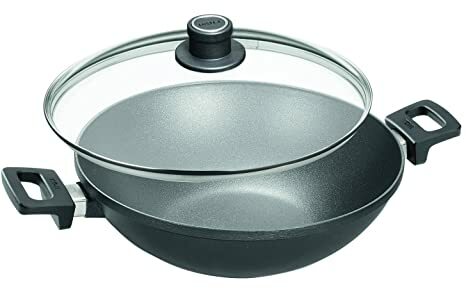 The approximately 8mm thick pan bottom of Nowo Titanium is made of stress relieved chill-cast aluminum and our ever reliable and cut resistant nonstick coating made of high tech titanium make for perfect heat distribution. A patented, detachable handle is ideal for turning the Nowo series into oven safe casserole dishes and allows for easy storage. The series is oven, dishwasher and metal utensil safe with a limited lifetime warranty. The coating is cut and abrasion resistant titanium hard base with excellent nonstick properties. The thermo bottom is approximately .3″/8mm thick cast bottom for optimum thermal absorption and no distortion even at high temperatures. The detachable handle allows easy storage, cleaning and oven use; safety tested by the Technical Control Board in Germany (TUV). The handle mount is an integral, threaded brass insert for sturdy, firmly affixed handles. The safety glass lids are for energy efficient cooking, ovenproof up to 480 degrees F/250 degrees C. The edge is additional reinforced to offer high levels of shock resistance and no mess pouring of sauces. Made in Germany. Wolls advanced titanium reinforced nonstick cooking surface has superior durability and excellent cooking performance. It is guaranteed not to crack, blister, bubble or separate. Titanium is one of the hardest metals and is used in many high tech products such as fighter planes, surgical instruments, hip replacements and golf clubs. The Titanium reinforced nonstick cookware is produced in our state of the art facility in Germany. For healthier cooking, no oils or fats are required. The extra thick body and base is made of stress relieved chill cast aluminum. This process allows for fast and even heat distribution, and better browning, searing and deglazing. These pans are milled perfectly flat for use on all types of ranges; gas, ceramic, electric, radiant and halogen. These pans are guaranteed not to warp. Patented German designed and engineered detachable handle insures easy click-on and click-off, for stove to oven cooking or storage. Each pan has a cast-in threaded brass insert to guarantee that the handle screws never strip or loosen. Ideal for anywhere storage or cooking space is at a premium. With the handles removed it fits easily into the sink or dishwasher. Titanuim Nowo cookware is oven safe (remove detachable handle, side handles and cover knobs are safe to 500F/260C). 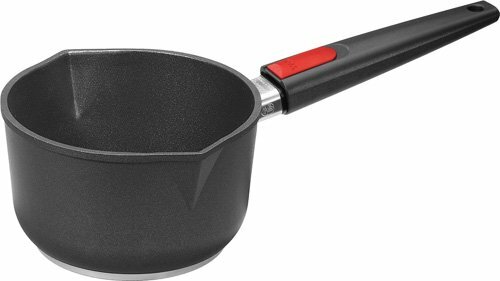 Nowo pans are metal utensil and, dishwasher safe plus are PFOA free. Made in Germany with a limited life time warranty. Woll’s advanced titanium reinforced nonstick cooking surface has superior durability and excellent cooking performance. It is guaranteed not to crack, blister, bubble or separate. Titanium is one of the hardest metals and is used in many high tech products such as fighter planes, surgical instruments, hip replacements and golf clubs. 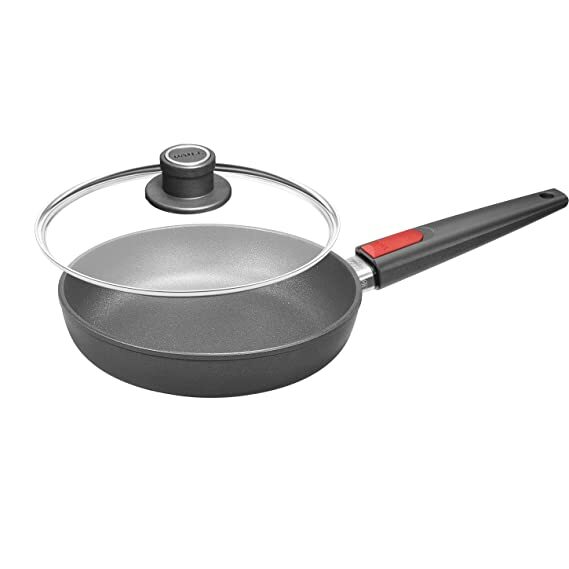 The Titanium reinforced nonstick cookware is produced in our state of the art facility in Germany. For healthier cooking, no oils or fats are required. The extra thick body and base is made of stress relieved chill cast aluminum. This process allows for fast and even heat distribution, and better browning, searing and deglazing. These pans are milled perfectly flat for use on all types of ranges; gas, ceramic, electric, radiant and halogen. These pans are guaranteed not to warp. Patented German designed and engineered detachable handle insures easy click-on and click-off, for stove to oven cooking or storage. Each pan has a cast-in threaded brass insert to guarantee that the handle screws never strip or loosen. Ideal for anywhere storage or cooking space is at a premium. With the handles removed it fits easily into the sink or dishwasher. Vented safety glass covers with Stainless Steel rims are available for separate purchase. Titanium Nowo cookware is oven safe (remove detachable handle, side handles and cover knobs are safe to 500F/260C). Nowo pans are dishwasher safe and PFOA free. Made in Germany with a limited life time warranty. Woll advanced titanium reinforced nonstick cooking surface has superior durability and excellent cooking performance. It is guaranteed not to crack, blister, bubble or separate. Titanium is one of the hardest metals and is used in many high Tech products such as Fighter Planes, surgical instruments, hip replacements and Golf clubs. The titanium reinforced nonstick cookware is produced in our State of the art facility in Germany. For healthier cooking, no oils or fats are required. The extra thick body and base is made of stress relieved chill cast aluminum. This process allows for fast and even heat distribution, and better browning, searing and deglazing. These pans are milled perfectly flat for use on all types of ranges; gas, ceramic, electric, Radiant and halogen. These pans are guaranteed not to warp. Patented German designed and engineered detachable handle insures easy click-on and click-off, for stove to oven cooking or storage. Each pan has a cast-in threaded brass insert to guarantee that the handle screws never strip or loosen. Ideal for anywhere storage or cooking space is at a premium. With the handles removed it fits easily into the sink or dishwasher. Vented safety glass covers with stainless steel rims are available for separate purchase. Titanium nowo cookware is oven safe (remove detachable handle, side handles and cover knobs are safe to 500F/260C). nowo pans are dishwasher safe and PFOA free. Made in Germany with a limited life time warranty.